Fig. 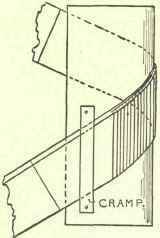 166 shows a sectional elevation of an open newel staircase, consisting of three short flights and two quarter-space landings. 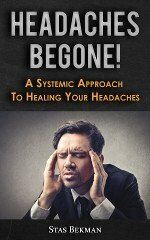 Reference is made to the various parts illustrated in the Glossary at the beginning of this chapter. It is shown with "close" string and capping into which the ballusters are fixed. 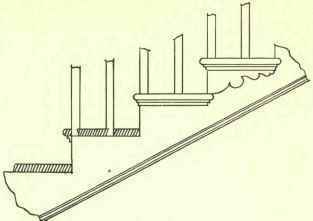 The second newel is carried to the ground, and the third may also be similarly treated if desired, and used as posts for the spandrel framing. The wall string is joined into the skirting on the top landing. Fig. 159 shows the method of constructing a geometrical stair consisting of two flights, with a quarter landing at the head of the first flight, and the second flight commencing with three winders. A portion of a Cut ox Open string is shown in Fig. 167. The ballusters are here dovetailed into the treads, the nosing being afterwards returned along the end, either by means of groove-and-tongue joints or by secret screws. When brackets are not employed the risers are fixed to the string with a rebate and mitre joint, but when brackets are used they are mitred to the risers. Ballusters may be either square or turned, in either case the ends being left square for fixing. With cut strings they are usually spaced two to each step; and with close strings, where they are fixed to the capping, they should be spaced from 4 to 5 inches apart. They are sometimes made from flat pieces about 4 inches wide by 3/4 or 1 inch thick with shaped edges. They are either tenoned into the hand-rail or screwed to an iron core which is fitted into a groove in the under side of hand-rail. The curved portions of outer strings in geometrical stairs, which occur at landings and winders, are termed Wreath Pieces. They are constructed separately, and joined to the straight lengths of string by means of a connection known as the "counter wedge key," or "counter cramp" (see "Joints"). To form the wreath piece, it is necessary to obtain the exact curve on plan and prepare a cylinder, or as it is sometimes called a "Dolly," to this curve. The cylinder is built on two ribs, narrow battens being nailed thereon and afterwards worked true. The piece of string to be bent is marked on the back between the springings of curve, and the back cut out to a veneer face. It is then well wetted with boiling water, bent round the cylinder, and secured as shown in Fig. 168. When in this position it is backed with narrow strips of wood glued and fitted tightly round, the whole being covered with a strip of coarse canvas glued on, which is not shown in the sketch. Another method of forming the wreath piece, and one frequently used, especially in hard-wood strings, is that of using veneer for the whole piece. In this case the ends beyond the spring-ings are backed with strips glued on parallel to the grain of the veneer, and known as "Tangent Backings." The wreath is then completed in the manner before described. Stairs should in all cases be fitted with Carriages, one up the middle and one near each side. These are pieces of timber, of stout scantling, which perform the dual office of supporting the stairs and providing a fixing for the soffit. The two outside carriages must, of course, be the same depth as the middle one, but they need not necessarily be so thick. The position is shown in Fig. 166. Stairs fitted with light, springy carriages, or with no carriages at all (as is often the case in "jerry" work), are usually of the genus "creaky." Carriage brackets are in many cases added in order to obtain greater rigidity. They may consist of triangular pieces, marked from the pitch board and fitted between the carriage and under side of tread, or pieces may be screwed to the side of carriage, fitting tightly up to tread, the lower edge being cut off to the same pitch as the carriage. In this case the weight is transferred to the carriage by means of the screws, the former method being more satisfactory and also more economical. Owing to accidents having been caused by people slipping on stairs, various devices have, during recent years, been placed upon the market with the object of preventing this, most of which, while they are primarily designed for iron or stone steps, are equally applicable to those of wood. All staircases where there is much traffic should have the treads fitted with a non-slipping attachment. One of the best and most satisfactory is that shown in Fig. 169; it is the patent of the Safety Tread Syndicate Ltd., and consists of a steel or delta metal plate, dovetail grooved as shown, the grooves being filled with lead. The exposed surface of the steel is reduced to a minimum by the V-grooves, while at the same time sufficient is left to prevent the lead from wearing away. An enlarged section is given, and also a portion of a tread illustrating the method of fixing, the tread being sunk to receive the plate. The general arrangement of stairs in a building should be such as to ensure ample light to all parts, especially turns and landings, while windows should be kept quite clear of strings. Another important point to be considered is that while as much as possible of the stairs should be put together in the shop, care must be taken that no larger portions are constructed than will readily go into position. For this reason, unless there be plenty of room, winders are as a rule fitted in the building. The width of stairs is in the majority of cases governed by circumstances, but where possible 3 feet between strings should be regarded as a minimum. The width should allow of two people passing easily.